My favourite quick day trip destination from Toronto is the charming historic town of Niagara-on-the-Lake. Located a stones throw from awe inspiring Niagara Falls, the petite vine village dazzles first time visitors with her choir of cute boutique hotels, romantic main street lined with horse drawn carriages, the Shaw Festival’s spectacular theatrics and handful of world class wineries. 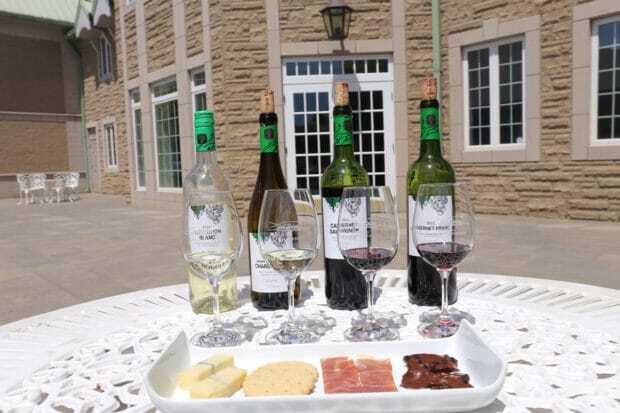 TripAdvisor recently ranked NOTL as the #1 Food and Wine Destination in Canada, a testament to the close-knit communities commitment to producing high quality local food and beverage experiences for culinary tourists keen on taking a bite out of Ontario’s best. 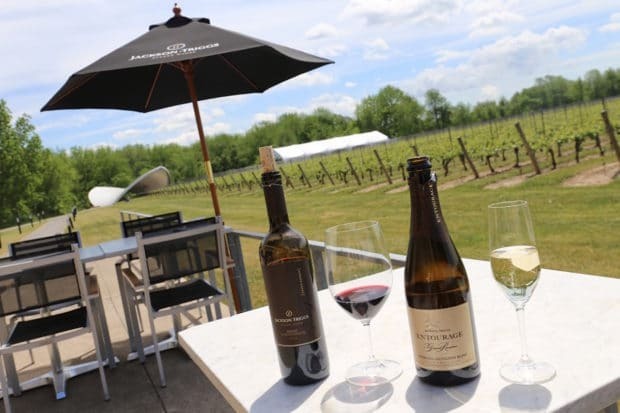 Nestled below the Niagara Escarpment amidst a landscape of vineyards and orchards stretching from the picturesque Niagara River Parkway to Lake Ontario, Niagara-on-the-Lake’s over 20 wineries are a mere minutes from each other. The region’s well marked wine route offers cycle fans a perfect opportunity to sip through the summer. You can easily bring your own bike for the ride via epic peddle-fest from Toronto, strapped to the roof of your car or enjoy kicking up your feet on the Go Train Bike Train. If you’re planning an extended stay check with your boutique hotel to see if they offer complimentary bikes for their guests. If a guided bike tour is more up your alley be sure to check out the slick rides at Zoom Leisure Bikes. 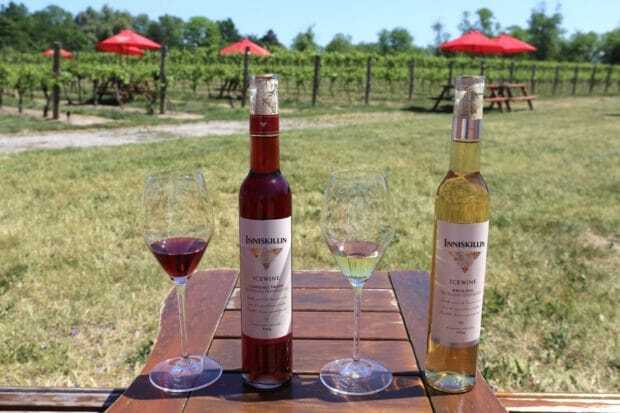 The Wineries of Niagara on the Lake host spectacular festivals throughout the year, favourites which include the Icewine Festival in January, Sip & Sizzle in May and Taste the Season in November. Year round you can purchase a Winemakers Selection Tasting Pass ($25 per person) which allows you to sample 25 carefully selected terroir wines from each of the regions wineries. Established in 2001, the Jackson-Triggs Niagara Estate Winery is one of the most technologically advanced winemaking facilities in Canada. With an emphasis on crafting super and ultra premium VQA wines, the 11.5 acres adjacent to the winery were planted with only the finest vinifera clones and rootstocks, custom grafted in France. Pinot Noir, Cabernet Sauvignon, Merlot, Cabernet Franc and Syrah are the most widely grown in the Delaine Vineyard, while white varietals like Chardonnay, Riesling, Sauvignon Blanc, Gewürztraminer and Sémillon round out the plantings. The winery is perhaps best known for its amphitheatre which hosts intimate concerts throughout the warm months that feature the best in Canadian musical talent. Wine and song beneath the stars makes for a transcendent wine country experience! Stratus Vineyards is located on a 62-acre estate and features a slick wine boutique, contemporary tasting bar and two private tasting rooms – all created by acclaimed interior designer Diego Burdi of burdifilek. Through its flagship wines, Stratus Red and Stratus White, Stratus Vineyards allows wine lovers to rediscover the noble tradition of assemblage, the art of combining several grape varieties to make a single wine. There is no recipe to follow; instead, each complex, age-worthy assemblage is an original composition that captures the essence of vintage and vineyard. To winemakers, who share an almost spiritual connection to the land, the concept of sustainability, of preserving the environment for future generations, is a familiar one. The team at Stratus embraced the opportunity to create a new kind of winery. Guided by the principals of loose fit, long life and low energy, they built an adaptable state-of-the-art facility that produces the best possible wine with the smallest possible environmental impact. The Stratus winery is the first building in Canada, and the first winery in the world, to receive LEED (Leadership in Energy and Environmental Design) certification from the Canada Green Building Council. Something miraculous happens in Niagara-on-the-Lake when the temperature dips to -8° Celsius; grapes left on the vine long after normal harvest begin to freeze. As the water inside the berries turns to ice, the natural sugars and other dissolved solids do not. It is at this optimal temperature and usually in the middle of the night, that the Icewine harvest begins. Perhaps the global reputation for cold Canadian winters gives an added credibility to the Icewines of Niagara-on-the-Lake, but there is no arguing that with the quality, variety and consistency of terroir, Icewine has brought worldwide recognition and acclaim. Synonymous with that quality is Inniskillin, credited with putting Canadian Icewine on the international map in 1991 by taking the prestigious Grand Prix d’Honneur at Vinexpo in Bordeaux, France. Many Inniskillin Icewines have since seen Gold and Best in Class awards at international competitions throughout Europe, Australia and North America. The estate features several restored and redesigned historic buildings, including the Brae Burn Barn, circa 1920. Once home to Inniskillin’s French oak ageing barrels, the newly refurbished Founder’s Hall provides an exclusive dining forum where guests enjoy wine inspired cuisine with a view into the modern Demonstration Kitchen. Château des Charmes was founded in 1978 by Paul Bosc, a fifth generation French winegrower. He did what no other winemaker in Niagara-on-the-Lake had done before, he planted Canada’s first commercial vineyard dedicated exclusively to vitis vinifera, the European grape varieties that make the finest wines. In May of 1994, after many years of planning, Chateau des Charmes opened its state of the art winery and hospitality centre. The buildings design was inspired by the grand old Canadian Pacific Railway hotels and its green roof is reminiscent of the iconic Chateau Frontenac in Quebec City and Royal York Hotel in Toronto. Today they farm four vineyards in Niagara-on-the-Lake, located in two distinct sub-appellations – St. David’s Bench and Four Mile Creek. Their premium single vineyard wines are a reflection of where they were grown. St. David’s Bench Vineyard wines are elegant with signature minerality. Just across the road, the Paul Bosc Estate Vineyard gives us wines that are bold and complex. The Estate Bottled series of wines use high quality grapes from all four vineyard sites that craft wines that are consistent from vintage to vintage. If you’re popping by on a weekday be sure to enjoy Four @ Four, a food and wine pairing program ($20 per guest) featuring four gourmet snacks (Quebecois ash cheese, sweet wafer, local prosciutto and currant flecked dark chocolate) each complimented by one of the wineries Estate Grown & Bottled series. 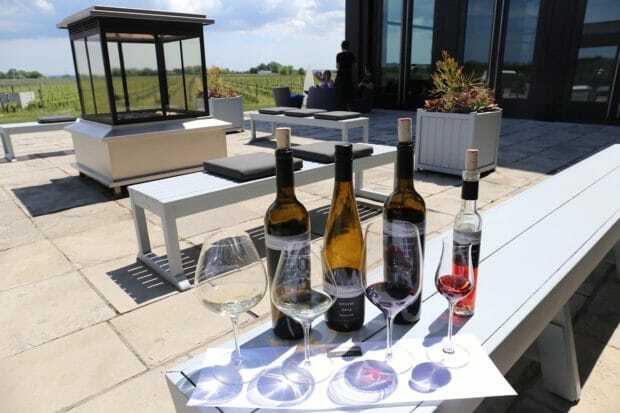 Just down the road, Ravine Vineyard is an organic winery which sits on 34 acres of land in the sub-appellation of Niagara called St. David’s Bench. The five generations old family farm plays home to the 200-year-old Loyalist Georgian Wm. Woodruff House. History buff’s take note, you’re now standing in one of Canada’s top 50 most architecturally significant ancestral homes! A painting of the property by one of the students of the Group of Seven Masters hangs on the wall in the tasting room. 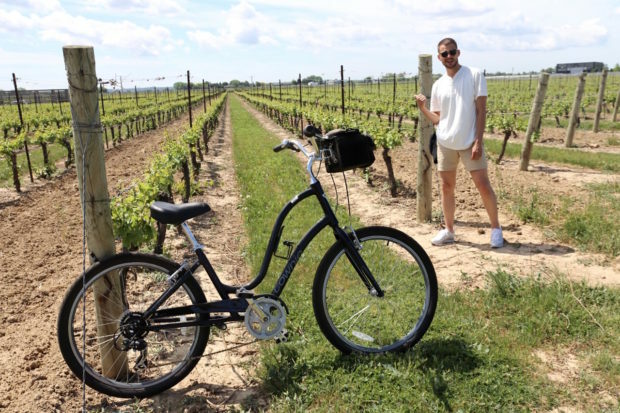 Be sure to end your bike tour here so you can enjoy an early dinner as the sun sets over the winery’s lush vineyard. Ravine’s top notch culinary team offer one of Niagara’s most inspired “farm to table” menu’s which focus on celebrating what’s fresh and in season. In the winter you’ll find house-made charcuterie paired with plenty of pickles while the spring and summer month’s celebrate the sunny season by serving up bright beets, tart rhubarb and cool leek and potato vichyssoise. 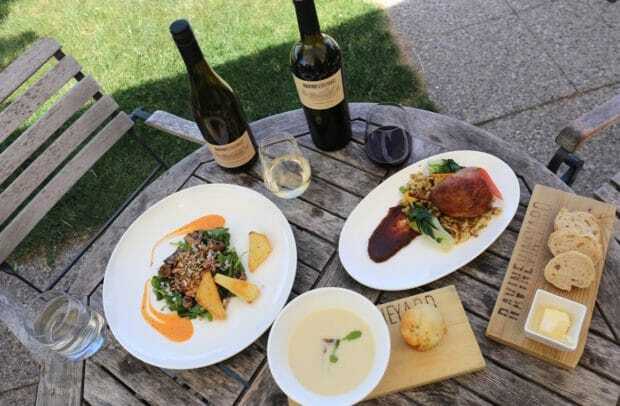 A suggested wine pairing is listed beside each dish on the menu, making those decisions at dinner a breeze after you’ve sipped yourself silly through Ontario’s wine country paradise.